In Part I and Part II of Why Bezels Matter to Rolex, we discussed the bezel utility of the Turn-O-Graph, Submariners, GMTs, and the Explorer II. In Part III, we continue onward examining the YachtMaster II, and Sky-Dweller bezels. Rolex’s tool watch functionality is also prevalent in both the YachtMaster and the YachtMaster II watches. The YachtMasters are primarily designed for the sailing world and being near water. Subsequently, the YachtMaster looks similar in design and functionality to the Submariner with a Triplock crown and profile similar to the Submariner case, but there are obvious differences in the bezel. Unlike the Submariner, the bezel is made entirely of platinum, and it rotates in two directions and is graduated such that it can time a period up to 60 minutes (eg. time between two buoys, or for timing your land-yacht at the parking meter). Unlike the traditional rotating bezels found on the older, traditional Rolex sport/tool watches, the YachtMaster II is an entirely different beast, due in part, to the bezel doing more than just simply rotating. The YachtMaster II was Rolex’s first watch that utilizes the Ring Command bezel whereby it is linked to the movement to program a countdown for a regatta starting time. This is Rolex’s first watch whereby a component from the actual watch movement is controlled by the bezel. The bezel is made of gold or stainless and utilizes a Cerachrom ceramic insert. Utilizing a combination of positions of the bezel in coordination with the winding crown, the 10 minute countdown timer is set. Rather than using the crown, or push buttons exclusively to set the time, the bezel is utilized to control the clutch mechanism connecting the count-down hand to the power train inside the watch. With Rolex’s latest foray into further developing the Ring Command bezel, Rolex recently released the Sky-Dweller, an all gold or platinum dress watch. The Sky-Dweller incorporates tool watch functionality and is designed for world travelers who frequently cross timezones and the International Date Line. Similar to the GMT’s design intent for global travel, the Sky-Dweller is a tool watch in a prince’s clothing as it utilizes the same DateJust design concept. The Sky-Dweller is Rolex’s first perpetual calendar watch, and it incorporates the ethos of the original Turn-O-Graph by taking a dress watch similar to the DateJust II, but adding functionality via the bezel. With the Sky-Dweller, the bezel links with the movement to set the date, local time, or reference time rather than relying upon the crown for those functions. 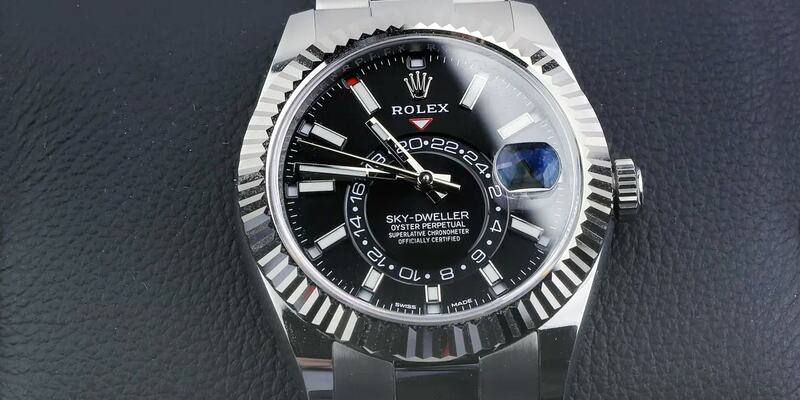 The bezel appears similar to a DateJust bezel but the bevel is a little flatter, but like the Yachtmaster II bezel, it controls the hands powered. Utilizing the bezel is what Rolex calls as incorporating “elegant simplicity” to the watch. Although simple to use, the mechanics behind it are a complex but with Rolex engineering, there is comfort that the mechanics are solid and reliable.